The Group's operating profit was EUR 65.4 (90.4) million. The Group's comparable net sales fell 7.5 per cent. VR Group's Board proposes paying a dividend of EUR 100 million to the state. In 2015, VR Group paid over EUR 460 million in various taxes and statutory charges. − Increasing competition resulted in reduced net sales for the Group. Due to efficiency measures, VR Transpoint as well as VR Track maintained good levels of profitability. Train ticket price promotions, and in particular the pricing reform in February 2016 have led to growth in passenger volumes, says Mikael Aro, President and CEO. VR Group is a significant employer. There are over 8,600 staff, of which about 8,100 work in Finland. The company pays nearly EUR 462 million each year in dividends and various taxes, license fees and employer contributions. This amount is composed of, among other things, payroll taxes of approximately EUR 125 million, employer contributions of more than EUR 95 million, as well as track taxes and charges as well as energy tax of almost EUR 59 million. In 2015, VR Group paid EUR 100 million in dividends to the state. The year 2015 was marked by improved efficiency in the VR Group. On the whole, net sales were satisfactory for VR Group in 2015, despite a clear fall. Comparable sales were down year on year in all business areas, most noticeably in long-distance passenger trains. The operating result remained at the previous year's level in both VR Transpoint and VR Track due to cost efficiency. The Group’s net sales in 2015 were EUR 1,231.4 million (EUR 1,367.2 million in 2014) and decreased by 9.9 per cent from the previous year. Comparability to 2014 is impeded by the exit from the group of the railway traffic control services company Finrail Oy on 1 January 2015. Comparable net sales declined by 7.5 per cent from 2014. The consolidated operating profit was EUR 65.4 million (EUR 90.4 million) and the net profit for the period was EUR 50.0 million (EUR 67.6 million). The net profit for the financial year includes profit on the sale of assets, which had a net impact of EUR 23.3 million (EUR 23.9 million). The comparable profit on operations excluding one-time items declined from 2014 mainly due to the decrease in net sales. Intensified price competition in public transport reduced the net sales in passenger services and reduced profitability. Net sales in VR Passenger Services remained below last year's level. Net sales totalled EUR 534.8 million (EUR 566.3 million). It declined 5.6 per cent over the year, which includes a 7.0 per cent fall in net sales for train transport, and a 2.3 per cent decrease in bus and coach transport. Due to successful sales campaigns, the decline in passenger numbers in domestic long-distance trains at the start of the year was stopped. The sharpest fall, of almost 20 per cent, took place in Russian passenger traffic volumes. During the year, it was announced that VR would aim to reduce prices. The impact of the efficiency programme launched in order to give room for price cuts was already evident in the costs at the end of the year, however the full impact will only be seen in 2017. The effects of the commuter service efficiency improvements are clearly visible in the 2015 results. At the same time, commuter passenger numbers are increasing, especially as the Ring Rail Line is now operational. 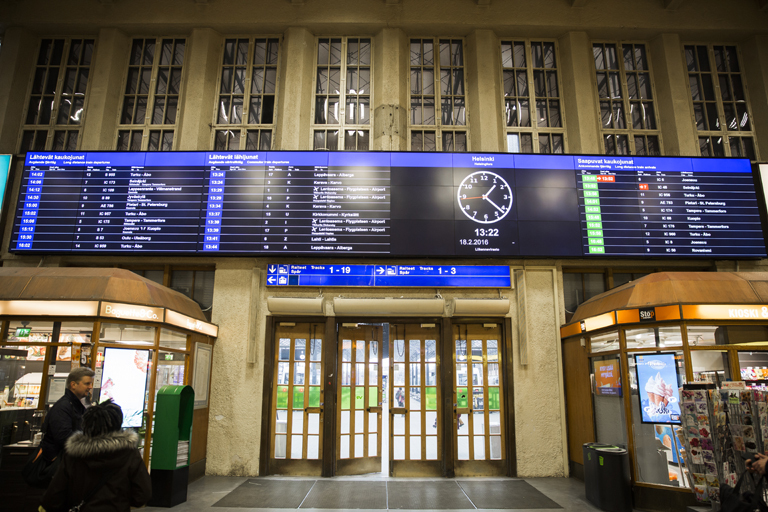 Passenger Services recorded an operating profit of EUR 9.9 million (EUR 32.8 million). A total of 111.1 million journeys were made in 2015, amounting to an increase of 3.7 per cent in comparison with 2014. Number of rail journeys (76.0 million) increased by 6.1 per cent from the previous year, while the number of bus and coach journeys (35.2 million) decreased by 1.2 per cent in the same period. The net sales of Avecra, the company providing restaurant services on trains and at stations, increased by 4.9 per cent, to EUR 34.4 million (EUR 32.8 million). Punctuality of long-distance services in 2015 was 87.2 per cent (87.8%), while the figure for commuter services was 94.7 per cent (93.7%). VR Transpoint’s transports consist almost entirely of raw materials and products for the mechanical and chemical forest industry, and metal, construction and chemical industries. VR Transpoint's total transport volumes in 2015 fell 9.1 per cent from the previous year's levels and came to 38.4 million tonnes (42.2 million tonnes). Despite a fall in volumes, VR Transpoint’s rail logistics maintained its profit level due to increased operating efficiency. The net sales for VR Transpoint totalled EUR 380.5 million and were down 12.6 per cent from 2014 (EUR 435.3 million). Net sales for rail logistics decreased by 12.3 percent and for car traffic by 13.5 per cent compared to the previous year (Hungarian business operations are taken into account up to June 2015). VR Transpoint posted an operating profit of EUR 27.0 million (EUR 24.9 million). Rail logistics punctuality remained at a good level throughout 2015 and was 93.1 per cent (93.2%). The target for freight traffic punctuality was 90 per cent with a 30 minute delay threshold. VR Track posted an operating profit of EUR 18.1 million (EUR 17.3 million). Net sales in VR Track declined by 4.3 per cent compared to the previous year, to EUR 300.5 million (EUR 314.0 million). Net sales decreased particularly in the construction business in Finland, but increased sharply in Sweden in maintenance operations. The decrease in Finland was mainly the result of the reduction in government funding of track maintenance and increased competition. Growth in the financing for Swedish rail maintenance contributed to the growth in net sales in Sweden. Despite the decline in revenue, VR Track was able to keep its result at the same level as 2014. The Group's total investments in 2015 amounted to EUR 119.8 million (EUR 169.0 million). Leasing agreements accounted for EUR 29.8 million of all investments. Expenditure on rail rolling stock totalled EUR 70.6 million (EUR 102.9 million). IT investments accounted for EUR 15.5 million of this total (EUR 21.2 million) and expenditure on real estate for EUR 17.6 million (EUR 15.4 million). The most important investments comprised new control and sleeping cars for passenger services and rolling stock for VR Transpoint. The impact of investment in new electric locomotives in 2015 was still relatively small, but its impact will increase substantially in the coming years. The other investments were replacement investments for fixed assets. The Group's liquidity remains strong. Funding of future investments into equipment and payment of dividends will reduce cash reserves in coming years. The Group's equity ratio was 72.6 per cent at the end of 2015 and without long-term leasing responsibilities, it was 83.5 per cent. The Board of Directors proposed to the Annual General Meeting that VR Group should pay a dividend of EUR 100 million to the state for the financial year ending on 31 December 2015. The Annual General Meeting approved the dividend payment proposal. The Group and parent company's distributable profit totalled EUR 199 million at the end of 2015.